What is the meniscus? - How are meniscus injuries caused? The meniscus cartilage is made up of C-shaped fibrocartilage tissue located within the knee joint. It allows the tibia and fibula bones to slide over one another reducing friction between the bones and prevents damage from wear and tear. 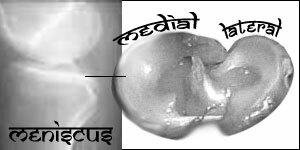 The meniscus cartilage also acts as a shock absorber preventing the bones smashing against each other with impact. Surprisingly this cartilage has yet another function in the knee joint acting as a stabilizer. Unfortunately the meniscus cartilage does not have a natural ability to heal. For this reason a meniscus injury should be treated with surgery as soon as possible. Older injuries that are left untreated such as tears, or tears that have resulted in wear and degeneration do not heal as well. Abnormalities and scarred tissue often occur if a meniscus tear is left untreated. If a torn meniscus is repaired allow 4 to 6 weeks of rest and begin low impact exercises such as cycling, swimming and most of all good yoga. Salamba Kapotasana is a common way to cause a meniscus injury. The risk is greatly increasesd when the yoga posture is entered with haste. This posture will also aggravate meniscus damage especially on the medial anterior part of the meniscus. However there is hope. Enter slowly and modify if necessary by moving the position of the knee towards the midline of the body rather than out to the side. This will reduce the strain in the knee but allow you to continue in a class and get the hip stretching benefits of performing this posture. Balasana the Child Pose in Yoga can be a good way to stretch the knees. Enter boundaries that are more mild than those in the posture shown. If the knee is swollen be very careful. Stretching into mild boundaries will increase range of motion and give a general good feeling within the joint. There are many symptoms of a meniscus tear. In a typical mild tear slight pain and swelling occurs. These symptoms usually subside in a few weeks and there is no need for surgery. Other postures that should be done mildly if at all are shown below. Many postures that stretch the knee into deep boundaries can commonly aggravate meniscus damage. Happily these postures can still be done with benefits such as increasing range of motion and relieving stiffness. Choose to do them mildly or the benefits disappear and aggravating the condition can occur. Try this posture with a block if at all. A much better choice would be to enter a mild Child pose shown at the bottom of this column. This is because yoga posture that involve all of the upper bodies weight falling upon a joint have increased risk of injury and are generally more dangerous. A slightly larger tear in the menscus can cause sharp pain and swelling within the joint. Swelling usually increases from the time the meniscus is torn and can often worsen over time. The pain may also disappear and suddenly retun when the joint is moved in a way that aggravates the damaged tissue. Paschimottasana is a seated forward bend in yoga. It is a good way to stretch the hamstrings. If the anterior meniscus is damaged maintain a slight bend but if the posterior meniscus is damaged straighten the legs to relieve the pressure. Use ice packs to help with swelling and reduce pain.